DaVinci Code Part Seven - Did Emperor Constantine Invent The New Testament? Of all the claims made in The DaVinci Code, the ones surrounding the veracity and origins of the New Testament are perhaps the easiest to refute, simply because there is such a great amount of authenticated historical evidence that confirms the commonly-accepted understanding of the origin of The Bible. Yet among the rejected gospels were many that were "earlier" than the biblical foursome (p. 234). These gospels contained "the original history of Christ" (p. 234), which was rejected by the official Church and embraced only among those labeled as heretics. Even though Constantine and the Church tried to destroy the non-biblical gospels, which Teabing refers to as the "unaltered gospels" (p. 248), some of them did survive. Of course the "Bible" as we know it today is the product of centuries of debate including a fascinating series of events surrounding the development of the "Old Testament" and its eventual inclusion in the Christian canon. The debate over the Biblican canon continued well into the Protestant reformation; to this day, Protestant Bibles omit several books included in the Old Testament by the Roman Catholic Church. The New Testament canon familiar to us was first listed by St. Athanasius, Bishop of Alexandria, in 367, in a letter written to his churches in Egypt. That canon gained wider and wider recognition until it was accepted at the Third Council of Carthage in 397, a council of African bishops much under the influence of St. Augustine of Hippo. But the origins of the New Testament canon go back even further. Around 180 AD, Bishop Iraneus of Lyons recognized the Gospels of Matthew, Mark, Luke, and John, as of divine origin and equivalent to the status of the Hebrew Scriptures. Other contemporaries such as Justin Martyr and Tertullian also emphasized the orthodox nature of Matthew, Mark, Luke, and John, as well as the letters of the Apostle Paul. Another document that surfaced around this time was The Diatessaron, a collection of material from all four orthodox gospels presented as a single document. In addition, early church writings indicate that each of the major churches not only had copies of the four Gospels, but also copies of the Pauline letters that outlined church doctrine (Romans, I & II Corinthians, Galatians, Ephesians, Philipians, Colossians, etc.) as well as other early orthodox documents such as the Didache, the first and second letters of Clement, and The Shepherd of Hermas. While many early church libraries also had copies of Gnostic writings, by the beginning of the third century AD most of these documents had been discarded by bishops and theologians as being heretical. Marcion of Sinope also attempted to create a standard scriptural canon for his own church around 150 AD, but his canon did not survive him; Marcion was fond of gnosticism and consequently held a strong disregard for the Hebrew Scriptures. Marcion's canon used portions of Pauline letters and orthodox gospels with references to Hebrew Scripture edited out, and also included a number of works later deemed to be gnostic in origin and therefore heretical. So it is clear that even though there were perhaps more than a dozen writings -- mostly of Gnostic origin -- claiming to be "gospels," the early church had already determined that Matthew, Mark, Luke, and John were the most reliable and the most likely to have been divinely inspired. There was also widespread agreement on the doctrines that the Apostle Paul spelled out in his various letters. All of ths is well-known and documented; therefore it is easy to say with great certainty that most of the orthodox New Testament canon was recognized by the early church long before its bishops met together for the first time in Nicea at the request of Emperor Constantine. An analysis of press coverage: "DaVinci Code" vs. "The Passion of the Christ"
Via a link at Stones Cry Out, here is an interesting analysis of the press coverage surrounding The DaVinci Code, as compared to the press coverage of Mel Gibson's The Passion Of The Christ two years ago. ■ While Mel Gibson was attacked and even psychoanalyzed for his religious beliefs, DaVinci Code author Dan Brown and filmmakers Ron Howard and Brian Grazer were never personally examined or challenged about their personal religious beliefs, their willingness to milk controversy, play fast and loose with facts, and offend Christians for personal gain. Whenever the networks decided to address fact and fiction in The DaVinci Code, they almost always found it was stuffed with falsehoods. But they never focused on the idea that Brown, Grazer, or Howard should be criticized for being too casual with the truth. Polly Toynbee's scathing rebuke of Christianity itself, published in The Guardian. Philip Pullman's objections to the "absence of Christian virtue" in the Narnia books, published by the BBC. The La Times trying its hardest to assert that C.S. Lewis never wanted Narnia brought to the big screen, and certainly not by Walt Disney. The New York Times digging into Lewis' past and insuating that he had a sexual relationship with a woman old enough to be his mother. I suppose the biggest laugh that Mel Gibson and Walden Media had at the expense of the press was that their films went on to be huge hits, despite taking huge hits from major newspaper writers. DaVinci Code Part Six - Was Mary Magdalene the "Divine Feminine"? The Holy One said to [Bartholmew]: "I want you to know that First Man is called 'Begetter, Self-perfected Mind'. He reflected with Great Sophia, his consort, and revealed his first-begotten, androgynous son. 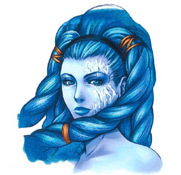 His male name is designated 'First Begetter, Son of God', his female name, 'First Begettress Sophia, Mother of the Universe'. Some call her 'Love'. Now First-begotten is called 'Christ'. Since he has authority from his father, he created a multitude of angels without number for retinue from Spirit and Light." This passage is part of a long-winded Gnostic explanation of the different personalities and spirits of God, a subject that is beyond the scope of these posts. But this passage (along with dozens of other passages from Gnostic scripture) illustrates the Gnostic belief that God was an androgynous being composed of a series of personalities emanated in male-female pairs. This line of thinking has led many to believe that the man Jesus of Nazareth -- if he indeed was the embodiment of the spirit of The Savior -- must have had an intimate relationship with an earthly female companion or wife. Many modern-day mystics and Christians who practice a synchretistic faith (that is, a faith derived from multiple belief systems) have latched on to the Gnostic view of the masculine and feminine characteristics of God and have sought to introduce feminine aspects of God into contemporary Christian theology. According to their teachings, understanding this "divine feminine" aspect of God is essential -- otherwise we are left with an incomplete understanding of God based only on His aggressive masculine traits. Therefore, recognizing "Sophia" (or "wisdom") becomes a central part of their belief system. These worshipers of the "divine feminine" revel in Gnostic teachings about Sophia, even though the New Age "Sophia" dreamed up by feminists bears little resemblance to the ancient Gnostic "Sophia". As for the Wisdom [Sophia] who is called "the barren," she is the mother of the angels. 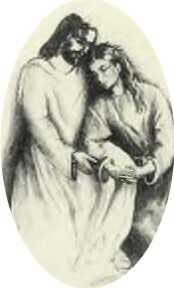 And the companion of the [...] Mary Magdalene. [...] loved her more than all the disciples, and used to kiss her often on her mouth. The rest of the disciples [...]. They said to him "Why do you love her more than all of us?" DaVinci Code Part Five - Was Jesus Married? Perhaps the most intriguing aspect of The DaVinci Code is the notion that the Roman Catholic Church would kill in order to keep its secrets safe. Chief among the many secrets that the Roman Catholic Church has allegedly undertaken to protect at all costs are the "true" accounts of the life of of Jesus of Nazareth. According to The DaVinci Code, Jesus of Nazareth was a Jewish prophet and teacher, but was not the "messiah" and was certainly not of divine origin. He lived a life that was typical for a citizen of ancient Judea -- he worked as a carpenter, he was married, and his wife bore him a daughter. But his life changed when he began to teach in the Temple and (as witnesses claimed) began performing miracles. His followers believed that he was the Messiah, and after he was executed by the Romans they stole his body in order to make it appear that he had indeed risen from the dead. And to perpetuate the idea of the divine origin of Jesus of Nazareth, they concealed both his marriage to Mary Magdalene and the existence of his daughter. The book also claims that three hundred years later, when the emperor Constantine adopted Christianity as the official state religion of the Roman Empire, he was chiefly concerned with the ability of the Roman Church to keep the empire's subjects submissive to Roman law. Constantine felt that in order for Christianity to be effective in this role, the myth of Christ's divinity had to be preserved and perpetuated. Under his orders, Church doctrine and scripture were assembled that met this criterion. Subsequently, all evidence of the "true" life of Jesus of Nazareth was destroyed by the Church. Most of us who grew up within orthodox Christianity consider the idea of Jesus being married to be so ludicrous as to not even merit comment. We reiterate our belief that Jesus was part of the lineage of Old Testament Hebrew prophets and point out that the Old Testament rarely mentions the marriage of prophets (the prophet Hosea being a notable exception). And we point to the divine origins of Jesus (born of a virgin and thus disconnected from the biological act of procreation) and to His divine mission, which was to be sacrificed as atonement for the sins of mankind. But what if -- as The DaVinci Code speculates -- there is another set of scriptures and religious traditions that both documents and explains the marriage of Jesus of Nazareth? 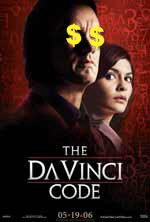 BoxOfficeMojo reports that The DaVinci Code brought in a respectable $77 million in the US and another $147 million internationally to become this weekend's top grossing movie. Curiously, there were no reports of Christians rioting, burning theatres, or issuing death threats against Ron Howard. The Times Online reports that Sony Entertainment is now very interested in filming another novel by Dan Brown, Angels and Demons. So congradulations to Ron Howard and his cast. They bucked the critics. Let's see if the movie continues to do well. Update: Make that TWO sequels. In my previous DaVinci Code post I briefly outlined the central beliefs of the ancient Gnostic Christians, a small yet influential sect that existed within the early Christian church. According to The DaVinci Code, the ancient scriptures of the Gnostics confirm the marriage of Jesus of Nazareth and Mary Magdalene, and also outline a deeper version of Christianity that is much closer to the true teachings of Jesus than the orthodox faith of modern Christians. Unfortunately, examination of the Gnostic scriptures reveals an elitist, anti-Semitic doctrine that dismissed notions of sin and redemption and instead concentrated on secret knowledge about God and the spirit realm that was revealed through the teachings of Jesus of Nazareth and through special dispensations from spirit beings. Gnostics believed that only those with both the intellectual capacity to understand the order of the cosmos and the spiritual discipline to abandon the pleasures of the flesh, would truly be saved. The fact that Gnosticism was declared to be heretical by the early church surely was the main cause of its demise as a major force within Christianity; by the fourth century AD Gnosticism had been reduced mostly to dusty collections of manuscripts in monastery libraries. But another factor must have been its esoteric nature. Skimming through Gnostic writings leaves one hard-pressed to believe that the vast, uneducated common population of the Mediterranean in the first and second centuries AD could have ever grasped the confusing worldview taught by Gnostics. In attempting to ascertain The Fullness of God by herself (which is impossible), the aeon called Sophia, or "Wisdom" committed a series of blunders. She was torn in two, and her "lower" spirit was cast out of The Fullness. The Lower Sophia (who was flawed because she was separated from The Fullness) then created several equally-flawed spirit beings for her own pleasure, including a spirit being known to Gnostics as "The Craftsman" or "The Arch-Begetter." Because he was flawed and had no knowledge of The Fullness, the Craftsman then created his own world and appointed himself God over it. The Craftsman and his flawed world are the God of the Old Testament (Yahweh) and his Creation, as described in the book of Genesis. Therefore, Gnostics took a dim view of Judaism, the Hebrew scriptures, and the Jewish race in general. To Gnostics, the Jews were dupes, fooled by The Craftsman into believing that he was the one True God. For this reason, Gnostic scripture contains no references to the Old Testament, and Gnostics rejected the idea that Jesus of Nazareth was part of the Hebrew prophetic tradition. The author of The DaVinci Code, Dan Brown, asserts that most of the controversial claims made in his novel can be traced back to ancient writings made by Gnostic Christians, an early subset of believers who were heavily influenced by Greek culture and mysticism. Gnosticism was declared to be heresy by the early orthodox Christian church, and subsequently Gnostics were excommunicated and their writings destroyed. Amazingly though, a nearly complete library of early Gnostic scriptures was unearthed near Nag Hammadi, Egypt in 1945. Those manuscripts, along with other fragments that have survived through the centuries, plus early orthodox Christian writings that attempted to prove the heretical nature of Gnosticism, give us a pretty good idea of what this ancient Christian sect believed. According to The DaVinci Code, the Gnostic scriptures reveal a version of Christianity that is far superior to the orthodox faith crafted by the Roman Catholic church. Is this true? 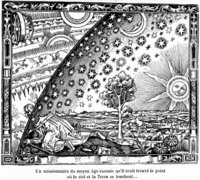 Did Gnostics practice a more 'authentic' form of Christianity? Valentinians further believed that they could never enter the spirit realm unless they took it upon themselves to cast off the temptations and pleasures of their corrupt mortal human bodies. What mattered most to Gnostics was the divine revelation of the secret knowledge of the spirit realm, for without it they could not be saved. It was this trait of Gnosticism that concerned early orthodox church fathers. While orthodox Christianity maintained that salvation through Jesus Christ was available to "whosoever believeth in Him," Gnostics believed that only a select group of intellectuals -- those who were able to grasp the complex details of their secret teachings -- would receive true salvation. Gnostics believed that only by understanding the true nature of God, the Fullness of the spirit realm, and the order of the universe, could a man be saved. As Gnostic scholar Elaine Pagels correctly observed, to Gnostics, "theology is really anthropology." ... according to Internet movie review site RottenTomatoes.com. On the other hand, Roger Ebert, with whom I usually agree, liked the movie. And make sure you read Ben Witherington's review. However, Mark D. Roberts' review takes the cake. In my introductory post on the controversial claims made in The DaVince Code, I briefly discussed the main conspiracy theory: Jesus of Nazareth was married to Mary Magdalene and the two of them had a daughter together. Evidence supporting this claim is supposedly contained in the scriptures of the ancient Gnostic Christians. Today I'd like to briefly discuss why the Gnostic scriptures still appeal to many, including some modern-day Christians. In 1945, two brothers digging for limestone to fertilize their fields unearthed a large ancient storage jar near the Egyptian town of Nag Hammadi. Inside of the jar was a set of Gnostic manuscripts dating back to the late fourth century AD. The manuscripts were written in Coptic, a form of the Egyptian language that employed the Greek alphabet. The manuscripts were stored while arrangements were made with the Egyptian government for them to be turned over to universities for scholarly study. Famed psychologist C. C. Jung, interested in Gnostic lore, took possession of some of the manuscripts. Since the publication of the Nag Hammadi library, several serious Christian scholars, including Elaine Pagels and Karen King, have written apologetically about ancient Gnostic Christianity. Pagels, King, and others have suggested that this ancient ideology, which relied heavily on classical Greek thought, still has important spiritual insights lacking in orthodox Christianity. In fact, there is a very active set of clergy and believers within several mainline Christian denominations who are looking to various belief systems, including Gnosticism, Eastern religions, and even Old Testament-era Eastern paganism, in order to find spiritual insights that they believe to be missing from Christianity. To these seekers, the ideas presented in The DaVinci Code have extraordinary appeal.